» Enrolled Agent Requirements: Meeting the Enrolled Agent Qualifications No ratings yet. 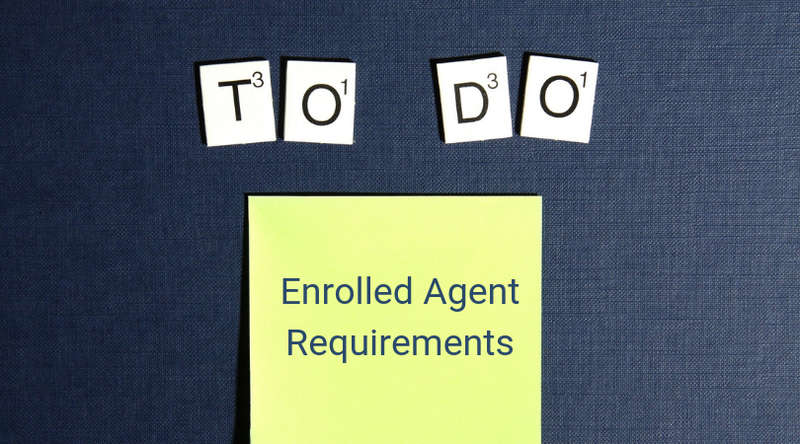 What are the requirements for the enrolled agent (EA) designation? Maybe you know the benefits of becoming an EA, but you’re not quite clear on the details of earning the designation. In that case, you need to know about the enrolled agent requirements. Then, you can see just how easy becoming an EA is and start your own enrolled agent journey ASAP. When compared to the requirements of other accounting and tax-related certifications, the enrolled agent requirements are quite simple. Currently, there are no enrolled agent education requirements. Instead, the primary enrolled agent requirement is obtaining a Preparer Tax Identification Number (PTIN). Create an account on the IRS website. Fill out the application by submitting your personal information and individual tax return. If applicable, any U.S.-based professional certification information (CPA, attorney, enrolled agent, enrolled retirement plan agent, enrolled actuary, certified acceptance agent, or state license) including certification number, jurisdiction of insurance, and expiration date). As long as you don’t have any felony convictions or discrepancies with your federal tax obligations, the IRS will grant you a PTIN immediately after you submit the application. When you apply online, the application process takes about 15 minutes from start to finish. Conversely, you can fill out Form W-12 and mail in your PTIN application, which takes about 6 weeks. As waiting 6 weeks adds a significant amount of time to your EA journey, applying online is more efficient and advantageous. Once you have a PTIN, you can move on to fulfilling the secondary enrolled agent requirements. If you have never worked for the IRS, you must take the EA exam, officially called the Special Enrollment Examination (SEE). If you have worked for the IRS, you may be exempt from taking the exam. To start, I’ll address the process of passing the EA exam. The EA exam and the SEE are the same, so the EA exam requirements are the same those for the SEE. Consequently, there are no education or experience EA exam requirements. Instead, a PTIN is the only thing you need for IRS exam eligibility – nothing else. Therefore, the process of applying for a PTIN covers your exam application as well. Consequently, you can begin studying for the exam as soon as you have your PTIN. To study effectively for the EA exam, you must rely on EA exam prep. You can learn all about the enrolled agent review courses available to find the best one for you. Then, you can use my EA course discounts to save big on your EA review materials. Once you’ve purchased a course and determined how long you’ll need to prepare for the EA exam, you can schedule your first testing appointment. To schedule a testing appointment, you must visit http://www.prometric.com/irs. Prometric is the organization that administers the EA exam, so you must contact them to make your testing appointment. If you’d prefer, you can call them at 1-800-306-3926 to schedule. If you go the online route, you’ll need to create an account. You can do so by clicking the “Create An Account” button in the “I Want To…” box, and then clicking “Create Account” in the login box that appears next. Follow the prompts to set up your user ID and password. Then, visit your email inbox, open the email you will have received from Prometric, click the confirmation link, and activate your account. Finally, log in at the Prometric website, enter your personal information (such as your PTIN), and click “Save and Continue” to finish your registration. After registering at Prometric, you must find your preferred testing center. Prometric’s website lists all of the testing centers in your area, so return to their site to get started. After clicking the “Locate a Test Center” button, you’ll be able to select your country and state from the drop-down menus. Then, you can choose which exam part you want to schedule. Next, you must enter your zip/postal code or address and city to search for nearby testing centers. After that, you can check the appointment availability of your preferred testing center by selecting a date on the calendar, clicking “Schedule an Appointment”, and following the prompts to schedule your appointment. You can also use the contact information to call the testing center and set up your appointment. When you’re ready to schedule your appointment, you must again supply information about your preferred exam part, testing location, and appointment date. You must then pay the testing fee of $181.94 per part. You can pay by credit card online or by electronic check over the phone. Finally, you will receive an appointment confirmation number. You must record and keep this number in case you need to reschedule, cancel, or change your appointment in any way. If you’ve worked for the IRS before, you may qualify to skip the EA exam and use your IRS experience to earn enrollment. Additionally, 3 of your 5 years of employment must have occurred within the last 5 years prior to your separation from the IRS. The IRS has established these regulations for former employees seeking enrollment in order to verify that an EA candidate’s IRS experience has provided them with the same overall background as someone who passes all 3 EA exam parts. If your experience has not supplied you with this background, the IRS will restrict your enrollment to a specific area of representation. The background check that ensures you haven’t engaged in any conduct that would justify the suspension or disbarment of an attorney, CPA, or enrolled agent from practice before the IRS. Furthermore, the IRS conducts the background check on your behalf as soon as you submit Form 23. The former IRS employee review can take about 3 months to complete. Therefore, the process of becoming enrolled via IRS experience will last at least that long, maybe longer. However, all you have to do during this time is wait, as opposed to studying for and passing the exam. For this reason, taking advantage of IRS experience if you can is still a worthwhile way to become an EA. After you’ve successfully secured the EA designation, you must meet a few other EA requirements to maintain your enrolled agent status. You must learn more about your enrollment cycle to meet these requirements. You should also factor the costs of EA CPE courses into your EA budget. Meeting these requirements may seem daunting, but they are not too demanding. Furthermore, keeping your knowledge up to date and your skills sharp so you can retain your EA designation is a small and useful price to pay. If you’re like most people, you’ll need to pass the EA exam to become an EA. Therefore, you should get started by learning more about becoming an enrolled agent. Then, discover which EA review course is best for you using my comparison of the best EA courses. You can also ask me any questions you may have by emailing or leaving a comment. I wish you the best with the EA! Does EA qualification makes sense for a person residing outside the US? Does it add value to a person who is already a CPA? Does it increases the chances of landing a job in the US for a person residing outside the US? Hi Nitheesh, I would say it is only useful if your clients are in the US because it covers explicitly US taxation. It does add value to some CPA, for those who want to specialize in tax and wants to advertise themselves this way. EA goes a lot deeper than the typical CPA coverage.